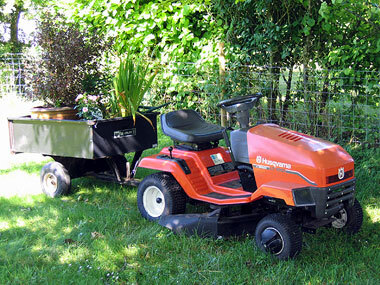 With all this grass around we just had to have a tractor lawn mower. We tried cutting it with a regular mower and it took 2 hours! Anyway after much searching we went to Salisbury Garden Machinery and bought a tractor and trailer second hand. We also ordered mulching blades and had them added by the guys at SGM. Mulching blades cut and chop the grass into tiny fragments which are then dumped back onto the grass as ‘mulch’. Saves having to find somewhere to store all the cuttings. It’s also is very good for the grass, stops it drying out apparently. Another good tip. If you buy a mini tractor make sure it’s capable of pulling a trailer. Really helps with pretty much everything in the garden from shifting sand, soil, hedge clippings wood etc. … and not forgetting it’s great fun of course.